When you have been in the wine trade long enough, in my case 30 years, there are certain wines that you follow as benchmarks; a sort of palate calibration that you undergo every year (vintage) as an imperative to get a bearing and setting a course into an ocean of wines to be tasted. With an intimate knowledge of these proven, consistent performers, this ritual can be a bellwether for vintage or regional anomalies and yardstick of how other vignerons have coped with a difficult year. I won’t divulge my full list of palate calibrators but as an example, Felton Road Bannockburn Pinot Noir sets the pace for New Zealand pinot noir, E Guigal Cotes du Rhone Rouge is my yardstick for Southern Rhone reds in the affordable realms, Maison Drouhin-Vaudon Chablis AC my benchmark for unadulterated chardonnay, Shaw & Smith Shiraz the measure for cool-climate shiraz – get the idea. For Tuscany and generally this covers a sea of Chianti, Rosso di Montalcino and proprietary blends of sangiovese, Monte Antico has been my barometer for as long as I can remember; given it has been around since 1977, it seems I have been drinking it for my entire wine career. 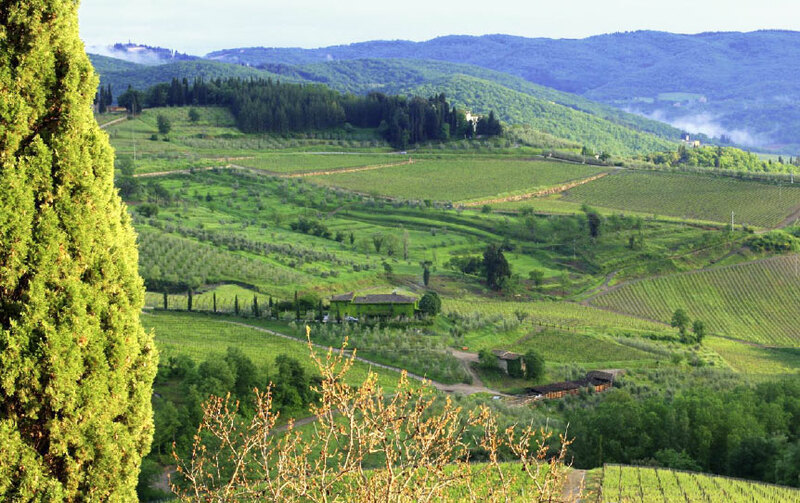 Monte Antico was founded by Neil and Maria Empson, Neil very much the man behind the scenes who has shaped the Italian wine industry more than any person in terms of overseas markets and brand building. Empson, a New Zealander who has resided in Italy for over 40 years, established Milano-based Empson & Co http://www.empson.com/ with his wife Maria in 1972 (behind every strong man is an even stronger woman), pioneering the export of Italian wines the world over and remains number 1 in the USA to this day. To put it into perspective, Empson was Angelo Gaja’s first export agent; he was at the forefront at the birth of Super Tuscans and spearheaded the cult Barolos moreover, has championed every region and micro-climate of Italy and his portfolio and reputation is unparalleled. You might be asking, why is this person not more famous in the wine (consumer) world? Well, like many of the wine merchants and industry movers and shakers they are very much incognito and whilst the Empson’s are greatly respected amongst the top winemakers of Italy and merchants the world over, with consumers more captivated by vignerons and prominent wine critics. Empson was also at the forefront of pioneering the so called Super-Tuscans, as coined by Robert Parker, where he saw great potential in wines that deviated from the orthodox if not antiquated wine laws that governed Tuscany. Wines like Sassicaia by Tenuta San Guido first made in1968 with cabernet sauvignon & cabernet franc, Vigorello by San Felice also in 1968 using sangiovese, cabernet sauvignon & merlot and the famous Tignanello by Antinori in 1971 made from sangiovese & cabernet sauvignon were the first to break ranks and have no DOC or DOCG classification. These days they are known or officially labeled as IGT (Indicazione Geografica Tipical – typical regional wine) and to qualify for this designation the grapes must come from one estate. The name Monte Antico is Italian for ‘ancient mountain’ and depicts their property in Santa Lucia, Province of Pisa, the vineyards and its terroir at altitudes around 1,350 feet with soils of fine-textured limestone, siliceous, calcareous clays and rocky outcrops. The Empsom’s have collaborated with the ‘Maestro’ of Italian winemakers, Franco Bernabei, to oversee the winemaking and blending, normally 85% sangiovese, 10% cabernet sauvignon and 5% merlot and aged 1 year in oak (80% in Slovenian barrels, 20% in barrique) with at least 6 months bottle age before release. The 2007 Monte Antico is current in most Asian markets so the wine has benefited from a further year or more in bottle furthermore, coming from a ripe, generous and early approachable vintage and is drinking brilliantly. That said, I would urge you to put several cases in the cellar/wine fridge to be drunk over the next 10 years, as the quality and structure is most definitely there. Indeed, I served this wine up blind to a tasting group recently alongside the 2007 Antinori Tignanello to which it showed very well; a little lighter in framework but with admirable complexity and a sixth of the price of the Tignanello. I am far from being the first commentator to say Monte Antico is consistently one of Italy’s better value wines, having been awarded many accolades over the decades. However, I think 2007 reiterates this and is an incredibly good wine for the money and it way over-delivers in its deep complexity and class. Perhaps it’s a characteristic of the vintage but it seems to be more plush and intense or pure in its fruit and a really satisfying and versatile wine. My notes read: Immediately captivating summers day in Tuscany aromas; baked clay, and hot terracotta tiles, earthy-herbal melange – infusion of dried thyme, lavender fields, wild rosemary – deep black berry fruits, dark cherry, blood plum, juniper berry with hints of liquorice, dark chocolate/cocoa, spicy black pepper and star anise; there’s an underlying smoky, complex meatiness with nuances of antique woods and leather. A juicy palate entry with a rush of crunchy cherry and plum fruit engulfing the mouth with succulence and suppleness that has you immediately reaching for the bottle to pour a second glass, elegant, easy drinking yet with sufficiently firm backbone that reminds you this is sangiovese with its chewy tannins and cut of acidity, moreover a penetrating tanginess with tamarillo and sour red currant keeping the fruit dancing on the palate (one of those characteristics of sweet/sour oscillation that new world producers simply cannot immolate) and intensely spicy and warming with invigorating natural acidity that has the palate salivating for more. Over all, this wine shows more juiciness and flesh than you normally see at this price point, brilliantly balanced and classy and would run rings around a lot of Chianti. And what does Monte Antico pair with – practically everything in the Italian cuisine repertoire! But it’s also very versatile for many facets of Asian cuisines – it has the spice, fruit intensity and tannins to counterbalance the richness in poultry and meat curries and hearty clay-pot casseroles, brilliant with duck, pigeon and quail, equally with BBQ and roast pork and just as its supremely drinkable and affordable with a pizza, the same could be said for friend rice and noodle dishes in Asia. In Australia, Melbourne based Italian specialist Trembath & Taylor are the importers, contact Michael Trembath E-mail: michael@trembathandtaylor.com.au Tel: 03 9696 7018 – but you will find it in all good wine stores.